Replacement in-the-door tools are made of high strength steel to avoid bending. The best value of any complete locksmith set we sell, the Value Set comes with the most popular in-the-door tools, the car opening manual, and enough accessories to open virtually every popular vehicle on the road. A collection of openings on video to help give you an idea on how to use various tools on various vehicles. A great training aid for any novice professional. Updated every single year, this manual includes detailed diagrams, images, and step-by-step instructions on how to open every single vehicle on the road since 1979 to present day. Our most complete locksmith set available, the Super Pro includes every accessory tool and enough long reach tools to concur any vehicle. The perfect set for the professional who wants to make sure all of the bases are covered when arriving on scene. Designed as a supplementary kit for a professional who already owns a Complete Locksmith Set and would like to have a more streamlined set for a secondary vehicle or emergency scenario. This kit includes just the essentials for most openings you will encounter. 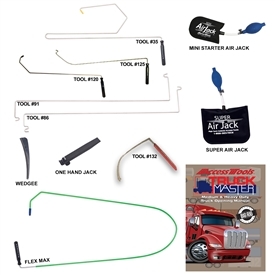 If you only ever work on Commercial Trucks, Heavy Duty vehicles, and 18 wheelers, then this kit was designed for you. Including only the tools needed to access these vehicles, and a Truck Opening Manual unlike any other in the industry. Access the Car Opening Manual from any device with internet access, including iPhones, iPads, and Android devices. In The Door Tools from Access Tools are the highest quality Car Opening Lockout Tools and Specialty Tools for the Automotive, Towing, and Locksmith Industries. 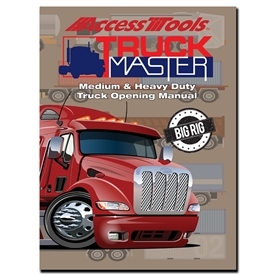 Updated for current year, this manual includes detailed diagrams, images, and step-by-step instructions on how to open every Heavy Duty Truck and Commercial Vehicle on the road since 1979 to present day.